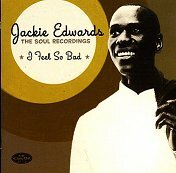 A very nice package to mark the place of Jackie Edwards in the history of Jamaican music, which should be much higher for this very underrated soul singer and creative song writer. There are 22 great tracks, mostly from his sixties period with Island records, sessions produced by Chris Blackwell. There is also an interesting booklet by Dave Edwards. It is issued on Castle Music CMQCD1370.